If you see one Christmas-themed theatrical event this year, let it be All is Calm. Unlike most Christmas shows, there is not a red and green banner, brightly wrapped present, or figgy pudding in sight. It does not present the usual frenetic cheery energy associated with the holiday. Instead it is quiet and lovely, joyous and melancholy, celebrating a remarkable event when soldiers put down their weapons and shared the spirit of peace across enemy lines for one brief and beautiful moment. 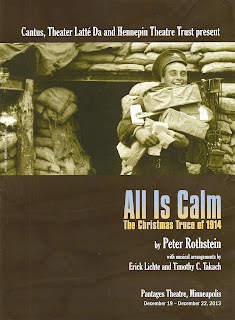 Created by Peter Rothstein and presented annually by Theater Latte Da and Hennepin Theatre Trust, All is Calm tells the story of the 1914 Christmas Truce during the first year of WWI, in which soldiers along both sides of the trenches on the Western Front stopped fighting and met in no man's land to exchange photos and stories, bury the dead, play football, and sing carols. This story is told simply on a bare stage with only some wooden platforms and crates as set pieces, with three actors bringing to life the words from actual letters, articles, and other historical documents, illuminated by songs performed by the marvelous nine-man a capella vocal ensemble Cantus. It's a perfect marriage of music and storytelling, not the story of specific people or characters, but rather the story of peace in the midst of war. What better representation of the spirit of the season? The piece runs a short 75-minutes, a seamless flow from beginning to end. 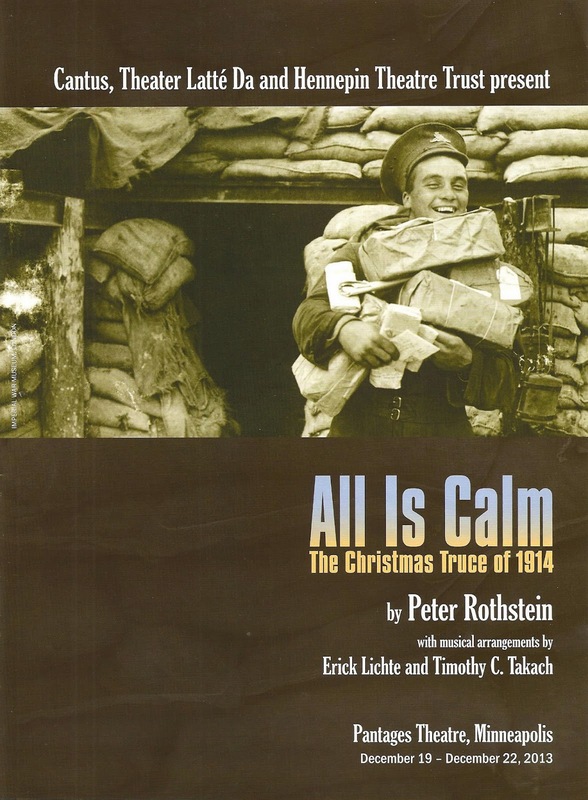 The songs are structured to tell the story of young men enthusiastically heading off to war, experiencing the fear and drudgery that is the reality of war, finding a brief reprieve one snowy Christmas day, and then being reluctantly forced back to reality as the cease-fire ends. Traditional British, French, and German Christmas carols like "Good King Wenceslas," "Bring a Torch, Jeannette, Isabella," and "Es ist ein Ros entsprungen" (one of my favorites), are combined with war songs both spirited and somber. The songs are perfectly chosen to evoke the feeling at each point in the story, and complement the words spoken by the actors sporting a wide variety of accents (Matt Rein, David Roberts, and Alan Sorenson). If you've never seen Cantus before, you are in for a treat. They are nine gorgeous voices perfectly blended in multi-layered harmony so beautiful, it's tempting to just close your eyes and let it wash over you (purchase music here, including the soundtrack of All is Calm). 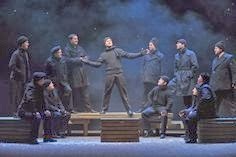 But the men of Cantus are not just singers here, they're actors as well as they play the parts of soldiers. Actors and singers are dressed alike in warm black layers, adding hats and gloves as the weary night continues. They fill the space in beautifully staged movement, sometimes standing at attention, sometimes laughing and joking and shaking hands. All is Calm is one of those shows that induces a trance-like state, aided by the fact that it's constructed with no applause breaks. The cycle of song - applause - song - applause can break the flow of the story, and there's none of that here. Just one long swell of music, words, and emotion. When the show was over, the trance continued as I walked out into the dark night with snow softly falling, the strains of "peace on earth" reverberating in my ears, the lovely and bittersweet feeling of the show remaining with me. This is the third time I've seen the show, and I think I love it more each time I see it. Only four performances remain, two today and two tomorrow. Take a break from the frantic holiday season to soak in the peace and beauty of All is Calm.